cleartarn is a website development company which specialises in database drive websites known as content managed system (CMS) and e-commerce and Ebay sites. The powerful CMS platform provides a basis for us to attach an enormous range of specialist and customised modules some of which are showcased on this site. Modules range from news and video systems through blogs and galleries systems to specialist Property Management and Membership systems. Using the Magento platform cleartarn offers a comprehensive range of e-commerce websites which can scale with your business growth. In addition we provide Ebay store implementations and can advise on the most suitable approach for your product range. cleartarn offers a complete website design, development, hosting and maintenance service. We also provide an active web presence management service where we manage websites and social media platforms to give clients an integrated communications message. A fully operational property website and real time data feed demonstration system can be seen at property.cleartarn.com - contact us for administration system access. 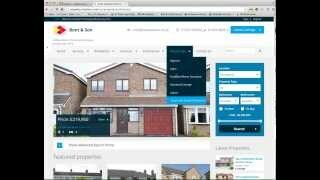 The cleartarn property website system is probably the most sophisticated property website system currently available. It has been designed to utilise the latest real time data feeds and is designed to be fully compatible with mobiles and tablets. Written by cleartarn CMS on March 13, 2014 in cleartarn Content Management System. Many businesses ignore the creation of disaster recovery plans because they feel that they are too difficult and time consuming to create and would they be any use anyway? For many businesses certain aspects of their activities can be easily dealt with by making sure that the IT systems are not only backed up properly, but are also accessible remotely in the event that the business is closed because of fire, flood, incident related closure. Where next for internal IT systems? The cleartarn blog system allows you to create unlimited blog entries and include tags and links which are then used automatically by the content management system to provide search information to the search engines. Links to the blog, news and video system can be incorporated throughout the site giving a comprehensive mapping capability. The blog system is fully calendarised and as with the news and video systems entries can be made in draft for publishing once approved and can also be archived if required. cleartarn provides a range of content management system websites and additional modules. We also build both eCommerce and EBay store sites. Our Webmaster Service creates and manages your website content and customer mailings. We pride ourselves is creating web content which adds real business value. Just give us a call or drop us an email to discuss your exact requirements.